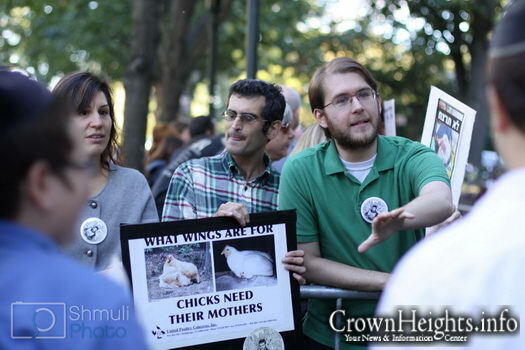 Last night, as hundreds of Jewish families gathered to perform the pre-Yom Kippur atonement ritual of Kaporos in Crown Heights, animal rights activists screamed “Murderers!” and waved signs of protest from behind a barricaded portion of Eastern Parkway. “I believe this is wrong. 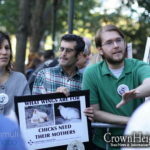 It’s animal cruelty,” said Park Slope resident Michael Dolling, 26. As feathers collected on the asphalt and the air filled with cacophonous squawking, Dolling took a five dollar bill from his pocket and purchased a chicken that had been just used for Kaporos with the intention of taking it to a farm animal refuge upstate. “I feel terrible not giving just $5 to save one life,” she said. Most of the participants at last night’s gathering paid no mind to Dolling and the other protesters, and concentrated on the ritual itself. “This is the Torah that came down from God to Moses. We don’t write the Torah, we follow the commandments,” said Shmuel Spielman. Spielman, 47, lives in Crown Heights and saw no issue with the hoisting of the live chickens, and was upset by protesters’ screams and accusations. “They’re being brainwashed, they don’t know the whole story. If they read the Torah and know where it’s coming from, they’ll see that we don’t make this up,” he said. Click here to continue reading at The Gothamist. This is truy ‘ TSAR BAALEI CHAIM ‘ . Use money instead. Am ho’oretz. The main kaporoh is from the shechitah; how do you shecht money? And you know nothing about the laws of tzaar baalei chayim, or you’d know that it’s only relevant when an animal is being tortured for no reason. If something is done for a purpose then TzBCh doesn’t apply. 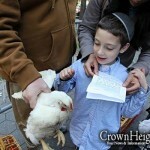 So even if you imagine the chickens don’t like being used for a mitzvah, it doesn’t matter, they don’t have to like it. lol, please use some critical thinking. by definition shechita is just the opposite of trar baalei chaim. Millhouse, that is what I would call being cruel, barbaric, sadistic. Excusing the purpose of an Halacha, and instead, excluding it for your own feelings towards the topic. Chicken-Kaporos should be banned forever in all places on this Earth! Now that we know that the chickens may well be suffering, we must change interpretations of Jewish texts to fit in with today’s society. Otherwise, you’d be called a fundamentalist, and for good reason. Not to speak for milhouse, but if not wanting to change = reform the interpretations of our Holy Torah to go with today’s society’s ideas of kindness and cruelty, means one must be labeled a fundamentalist, I’m proud to have that label. — Firstly there as no reason to attack the commenter, many great Talmidei Chacomin agree with him. The facts are that not everyone doing this minhag of Kapores does it in a gentle and loving manner, and reports of terrible abuses come out all the time. You cannot be so blind as to have missed these often repeated facts. — More significantly though, you are completely wrong to state that “the main kaporoh comes from the shechita.” Hear this and understand: Kaporoh comes ONLY FROM HASHEM, and there is absolutely no way it can come from shechting an animal or from anything else. The main thing is to focus on praying to Hashem, not on literally practicing a minhag that is not universally accepted — especially since while this minhag was possibly appropriate for another time and place, when people lived together with chickens in and around their homes, it is clear that it cannot properly be adapted to our urban societies in our modern age. Give Tzeduka, pray to Hashem, try to serve Him with a whole heart, and may He grant each and every one a Gemar Chasima Tova! Of course kaporoh comes from Hashem, but how do you get a kaporoh from Him? He set up the world so there are things we can do to achieve the results we want. We sow seeds and crops grow. We build houses and we have shade. We vaccinate children and they don’t get diseases. And He set it up so we have ways of manipulating things Above. Korbonos are one such way. Seguolos are another. And kaporos is a segulah, that is endorsed by the Geonim, almost all the Rishonim, and especially the Ari Zal. It is universally accepted by the only people who matter; the naysayers can go below. Milhouse continues to spout silliness, ignorance and superstition and could be a poster-boy for illustrating what is wrong with this minhag, that it produces bird-brained foolishness, insensitivity, crassness and arrogance — insisting it’s a Mitzva when it is clearly Baal Tosif and Osur to call it that, saying the “main kapora” comes from killing a chicken when Kapora only comes from Hashem, believing that swinging a chicken somehow mystically moves spiritual forces, saying that anyone who disagrees “can go below.” Milhouse you need to repent from your obnoxious ways. It is well known that many great Gedolim, including the Ramban, Rashba, and Shulchan Aruch, were clearly completely against this minhag because they considered it “Darchei Emori,” a non-Jewish ritual that goes against the spirit of Judaism, and which forbids sacrifice except in the Beis Hamikdosh. That some Gedolim permitted or encouraged the minhag does not give you the right to curse anyone opposed to it the way you do. As for the use of Tzeduka money as an alternative to the chicken-style kapores, though Milhouse says there is no source for it, for starters it is an open Posuk “Chatoecho B’Tzeduka Pruk” (Daniel 4:24), and as we say in the Rosh Hashona and Yom Kippur davening “U’teshuva u’tefila u’tzduka ma’avirin es ro’ah hagezeira,” and this is explained in many places. Milhouse calls others Am Ho’rotzim, but the Pegam is really his own. they will scream what they scream. Maybe we should scream HARASSERS GET A LIFE. really, they have nothing better to do? Maybe some real honest Tikun Olam would work. Why he be joining the protesters? Without diminishing the importance of Kapores Mr.Spielman seems to be somewhat confused. Reading the “Torah” will not in any way educate someone to believe that Kapores is a mitzvah.It’s not mentioned anywhere in Tanach nor in the Gemorah.It is a minhag that has been accepted by most of religious Jewry many of whom use money instead of chickens. The Alter Rebbe’s Shuchon Oruch is also Torah. 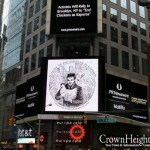 So is the Ramo, the Shaloh, and all the other sources who endorse kapporos davka on a chicken. These left wing lunatic tree huggers need to get proper jobs & stop bothering law-abiding people. They should also stop eating animal protein (inc eggs) & stop wearing leather shoes. I don’t know why this is news, they want publicity, just ignore them & they will slither away. They have jobs — this is their hobby (except for a few professional agitators for whom this is their job). Everyone needs a hobby, and theirs is making nuisances of themselves. Oh, and most of them are vegetarians, and make the same silly protests every Thanksgiving. If Kaporos upsets these hypocritical idiots so much, then it is a mitzvah. Neither the Mechaber nor the Rambam “abhorred” it. As far as I know the Rambam didn’t even mention it. Maybe they didn’t do it in Egypt in his day. The chapter headings in the Shulchon Oruch are not from the Mechaber, so they don’t show anything about his opinon. But above all, we do not pasken from the Mechaber or the Rambam, we pasken from the Alter Rebbe’s Siddur, which stresses the great importance of this minhog. And don’t forget that “minhag yisroel Torah hi”, “a minhog brecht a din”, and the Rebbe’s sichos about Simchas Torah being higher than all the rest of Tishri precisely because it’s a minhog. whether we choose to do it or not, it is not necessary to sound like you know whats right. if you choose to do it with money, ok, if you want to do the traditional way, it is fine, it is regular kosher slaughter. There are billions of people around the world who eat chicken, and their manner of slaughter is not even as humane as the KOSHER way. So I say to the activists: you are cowards to pick on people whe are coming to do a peaceful religious activity. As the person above said, go to some meaningful TIKKUN OLAM” and thats it. Go visit a hospital, help sick people, or something meaningful. Its just silly and useless to pick on a few peaceful people for some chickens. Find a pet store who is neglecting their animals, that will work. OH, but maybe if you soul search, you will find that you’re doing it for anti-semitism? maybe……. lets all just get along. Isnt that sensible? In fact in the Rebbe sichos it says that minhag yisroel is greater then Torah it comes from hire source. Sources, please, for the Beis Yosef and Rambam “abhorring” a Minhag Yisroel accepted by the Tur the Mordechai and many others. The Alter Rebbe doesn’t bring the money substitute for chicken option at all! According to many, this may well be included in לא תסור, which is a Possuk. What is ironic, though is the last Se’if of the Alter Rebbe’s Hilchos Kapparos. Please look it up, and see what the Torah says about being kind to animals. As for the “It’s not just Jews”. I don’t buy it. There are hundreds of grocery stores and restaurants in park slope with lobster tanks ready to boil them ALIVE, and these guys would never go protest them. These are attention seeking Jew haters. Lobsters can’t feel pain. And PETA do protest thanksgiving every year, and compare it to the Holocaust. They also protest medical research that could save thousands of human lives, because to them there’s no difference between a rat and a person. Kaparos is a religious srrvice, it is a crime to disrupt a relugious service……..? No, it isn’t. This is a free country, people are free to protest anything they like, religious or not. It’s not the actual lapses that’s tzara baalei chayim, it’s the way that they are kept, treated, & held & most die rather than being shechted. The mitzvah of shechita is in order that the animal shouldn’t be harmed in any way whatsoever! It’s the opposite of tzara baalei chayim, which is an aveirah! If this is how the chickens are being treated, one shouldn’t even be permitted to use them for kapparos! Kapparos is allowed to be done with money & this should be the preferred way in a society that treats the chickens in this way! 1. Most die rather than being shechted?! On what planet? Why are you making up such blatant lies? Anyone who’s been to kaporos can see that they are shechted properly. Of course no matter what you do there is going to be some small number that die, just as happens at any shlachthouse, but it is not a large number, let alone “most”. Anyone who claims that is a liar. 2. Who told you that “the mitzvah of shechita is in order that the animal shouldn’t be harmed in any way”? Since when? The mitvah of shechitah is a gezera from Hashem, and has nothing to do with the animal’s welfare. 3. Who says kaporos can be done with money? What is the source for that idea? Question: Why don’t these “enlightened” inviduals who are so quick to scream “murderers” (R”L) ever make their way over to protest in front of an abortion clinic? I understand that they could care less about anything to do with Torah (other than to fight it), but even on a societal level, aren’t there more pressing issues like abortions, terrorism, a broken medical system, wrongful convictions, overuse of prisons, medical malpractice, other atrocities, R”L. See there were a number of MOers involved too. If the activists want to put their money where their mouth is, and support a beacon of Modern Orthodox goyishkeit at the same time, perhaps Yeshiva University can start a Yizkor board with the names of each chicken. I know a plaquing place that would love the business. How come I don’t see them protesting in front of Kentucky Fried Chicken?